The CBI opposes a vote on Britain's membership but some business groups disagree. Ed Miliband is hoping to boost his business credentials by promising to oppose a British exit from the European Union in a speech to the CBI's annual conference today, but it's unclear whether the business community will have his back. Miliband could find a friendly audience - although it wants to see reforms, the CBI is a massive cheerleader for the EU and has warned that a referendum would be a distraction from focusing on Britain's economic growth. 'The UK’s membership of a reformed EU is overwhelmingly in our national interest. Eight out of ten CBI members, large and small, would vote to stay in the EU in a referendum,' its president Mike Rake said this morning, although he added that the issue of an in/out vote was a question for the Government to deal with. Prime minister David Cameron reiterated his plans to renegotiate Britain's relationship with the EU before holding a referendum in 2017 at the conference, hitting out at the idea that the UK should stay in 'come what may'. 'Simply standing here saying I will stay in Europe and stick with Europe come what may is not a strategy, is not a plan and that won't work,' he said, adding that renegotiated membership would be better for his audience's 'shareholders and customers'. His coalition partner Nick Clegg, on the other hand, compared the Tories' attiitude to the EU to throwing the toys out of the pram. Labour, meanwhile, has been struggling to communicate how it plans to deal with the European question. Miliband wants to reassure businesses that he isn't a threat after Labour pledges to boost corporation tax (to cut business rates), cap energy prices and reinstate the 50p tax rate didn't go down so well. 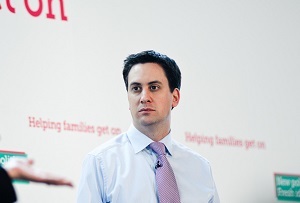 As with all things in politics, though, Miliband's speech won't find favour with everyone. Business for Britain, a eurosceptic lobby group, accused the CBI of bias, highlighting £800,000 in payments it has received from the European Commission for producing economic data surveys.